I would like to make a pitch that we add a "this question belongs on ELL" to the Off-Topic sub-menu, and begin closing questions as Off-Topic, rather than General Reference, when they don't belong here. To be clear: I am not suggesting we punt all bad/obvious questions to ELL. General Reference still has a place when the question is truly general reference. It is a better user experience for the asker. Instead of being told to do a lot of work to move the question themselves, the question would be migrated for them. Seems more friendly. It is a better user experience for the answerer. There is a built-in path for addressing questions that don't belong -- why not leverage it rather than having everyone doing their own thing? It is better for the community. When there's a question that belongs on Writers.SE, we don't leave it hanging around the English main page as "Closed", do we? I think the migration still requires user intervention, doesn't it? Can't we trust the mods to only migrate questions that have a chance of belonging? If several high-rep users all agree that it belongs on ELL, isn't that a good indication that it probably does? 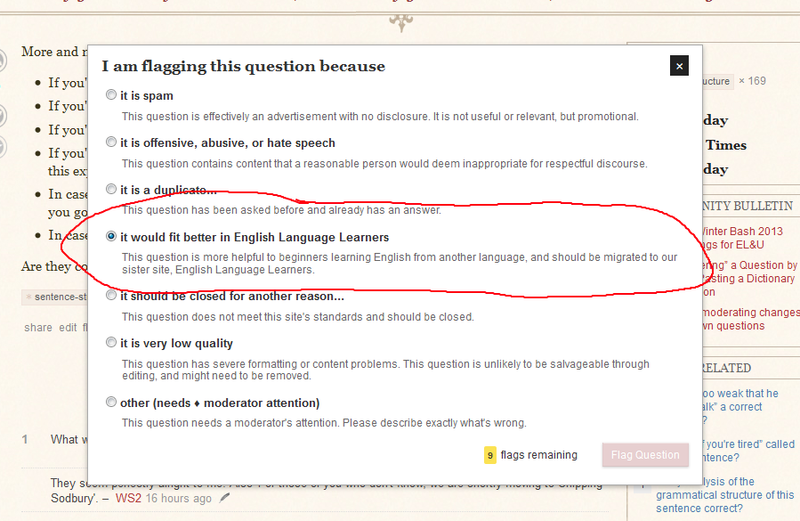 If questions are migrated erroneously, can't the ELL mods just close the questions when they arrive, and talk to us if it's becoming a problem? It is now September 2015 (plus one day from the last count) and we do have this capability, courtesy of The Powers Who Do That Sort Of Thing. I'm sure there will be statistics gathered and pored over to see how many questions migrated from here are closed on ELL. Learners' questions should be migrated; but a poor question is a poor question. Try and edit it into shape first. There may be some more concrete guidelines forthcoming, depending on how things go. It doesn't matter if there is already a duplicate on ELL, because there will be an additional pointer to it with the migration, and there may even be the stub left on ELU to help, too. I'd like to add one more counterpoint. Unlike many other SE sites, ELL was borne out of a frustration that ELU was being overrun by too many basic questions – questions that deserved to be answered, but weren't a good fit for the ELU site. Because of that, as these questions continue to crop up on ELU, there ought to be a way to expedite their migration to their rightful home. That just seems natural to me. ELL might be working to "define itself." Even so, a large part of its heritage is these misplaced ELU questions. It is now September 2015 and we still don’t have this capability. Can't we trust the mods to only migrate questions that have a chance of belonging? Yes, but mods can migrate questions anywhere, this doesn't require an extra migration path in the off topic close option. Only if the high rep users understand ELL, so only if the high rep users here are also highly active on ELL. There are no ELL mods at the moment, only the general SE community managers.